TOP SECRET (just kidding :). If you want to enable Team Edition feature pack for your Reply account, here's a simple guide on how to do it. You must be the team owner to enable Team Edition. Note: You cannot revert after you enable Team Edition. Switching to Team Edition merges contacts, campaigns, schedules and templates of all team members. During the Team Edition setup, in case any of the steps fails, Team Edition will not be enabled. In this case you must fix all conflicts and run the wizard again. We strongly recommend to enable Team Edition in Public mode in order to set it up for the organization requirements and then switch to Private mode if needed. 1. Open the Permissions tab of the Team page and click Enable management. 2. On the next step, you must set the default permissions for your team. Select Public or Private and click Next. 3. Reply merges your team member blacklists into one list. During this step, you can edit or delete blacklist entries. Click Next to move to the next step. 4. Reply merges all prospects from all team member accounts. Your team members may have the same prospects in their Reply accounts. 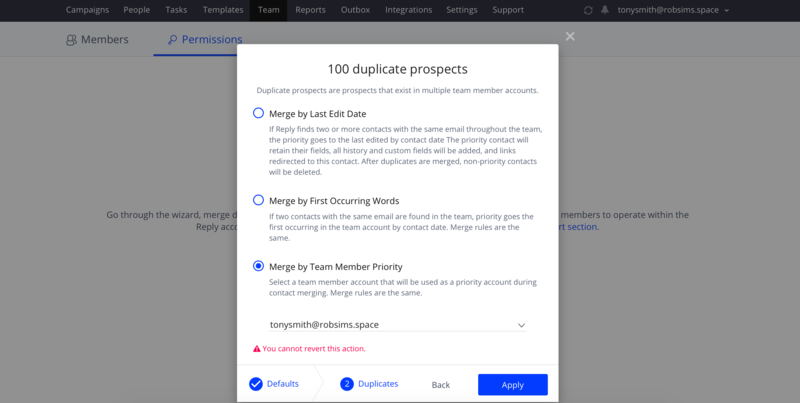 In this case, you will be prompted to decide, how to merge prospects - by Last Edit Date, by First Occuring Words or by Team Member Priority. Select the desired option and click Apply. Note that the Email field is the identifier of a unique prospect. Select the Merge by Last Edit Date option. In case you choose the by First Occuring Words or by Team Member Priority, please blacklist opted out prospects in all team member accounts before merging. Now you can collaborate within your team.